Our good friends over at Scholastic UK designed the Laugh Out Loud Awards 2017 to celebrate the very funniest books in the world of children’s fiction. The shortlist features the Lollies judges’ twelve funniest reads, ranging from picture books up to books for 9-13 years. But now it’s where you come in – because the winners of the Lollies are decided entirely by teachers, parents and children. Below are the books which made the shortlist – which will you vote for? 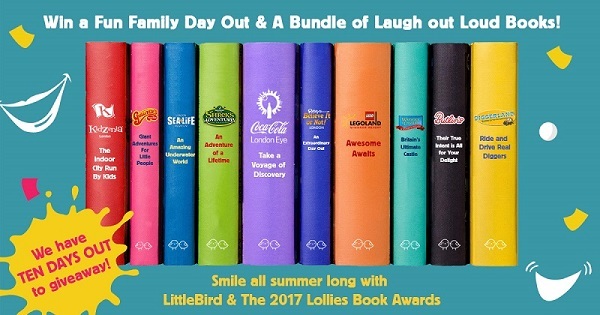 What’s more, we’re running an awesome competition with The 2017 Lollies Book Awards where you could win a fun family day out and a bundle of laugh-out-loud books. We’ve got no fewer than TEN fantastic days out to give away this Summer, plus four Lollies shortlisted books in your chosen age category. Enter here for your chance to win!